Act fast! 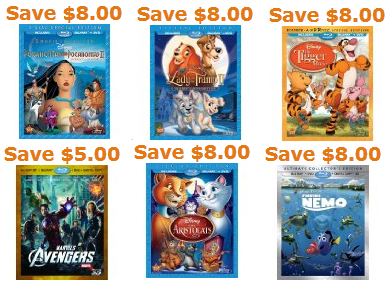 Amazon has just released $5.00-$8.00 coupons for seven upcoming Disney Blu-ray releases. These coupons are on top of some already great discounts. So it’s a really great deal! You’ll want to hurry, though - these coupons are only available until June 7th, 2012. After that date, you will need to wait closer to the release date, when Disney Movie Rewards reveals their release week coupon. Which Disney Movies will you be adding to your Collection?